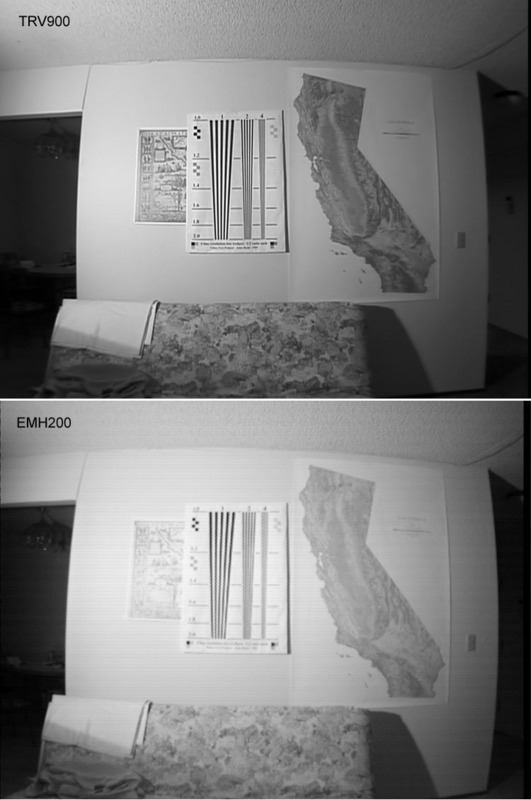 I got the EMH200-L38 1/3" CCD B/W Board Camera (Matsushita/Panasonic) from Rock House Products ($200). As you see in the photo above I mounted it on a small piece of wood with a 1/4"-20 nut glued to the bottom so I could put it on a standard tripod. The vendor's web page claims a resolution of 550 lines (H) x 420 Lines (V) for this camera. If it really has 550 lines of resolution, the image sharpness ought to be comparable to or better than the TRV900. However as you will observe from the stills below this is not the case. I mounted the two cameras by turns on the same tripod. The EMH200 is of course manual-focus only; I adjusted the lens carefully for the sharpest image. I captured stills using the "Snappy 3.0 Deluxe" at 1500x1125 in highest quality mode, then downsampled to half size (750x563) in photoshop, with no further processing done. 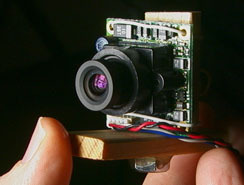 I had to use the 0.5x wide-angle adaptor on the TRV900 to match the focal length of the board camera's lens. 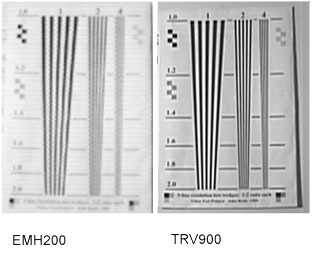 I didn't match the field of view exactly: the TRV900 ended up a bit wider. Despite this it clearly captures more detail on the resolution chart. Click the image to see full frames from both cameras.